In the early 1920’s glow in the dark watches were the newest fad out there. The United States was in a radium craze. Doctors preached its health benefits when consumed in small amounts and food products laced with it were even sold in grocery stores. Its “benefits” were even targeted towards women through beauty products claiming to give you a radiant glow. But those female factory works now forever in history known as the “ Radium Girls” truly got the worst end of the radium craze. The women working in factory painting clock faces. 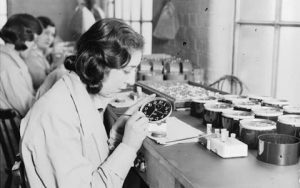 The Radium Girls were women hired to work in the glow in the dark watch factories painting the numbers onto watch faces. In order to get the numbers as precise as possible they were told to put the tips of the brushes into their mouth in between strokes to make it extra pointy. As a result they were ingesting radium constantly throughout their workday. Because management emphasized how safe it was to handle some of the women even began painting their nails with it so they would glow in the dark. Their teeth began to fall out, their bones would break suddenly just from standing up; one woman went to have her tooth pulled by the dentist and her entire jaw ended up coming out with the tooth! Radium poisoning happens because radium is very similar to calcium chemically, so the body mistakenly incorporates it your bones, leading to bone necrosis, which is death of bone tissue and leads to tiny breaks in the bone and eventually the complete collapse of the bone, and bone cancers. But glow in the dark nail polish is still a cool idea! Here’s how to make your own (not jaw breaking) glow in the dark nail polish in five easy steps! Start by activating your glow stick by giving it a snap and a few shakes. Once your glow stick is glowing, it’s ready to use! Carefully cut your glow stick in half with sharp scissors. Be careful not to spill any of the liquid out. Squeeze the glowing contents of the glow stick into your nail polish. If you’re having trouble getting it all out, you can also cut the top end of the glow stick to allow the liquid to flow down more easily. Thoroughly mix your nail polish with the glowing solution by giving your nail polish bottle a quick shake. Make sure the glow is evenly distributed through the polish. Apply your newly mixed glow nail polish to your nails. Disclaimer: Nail polish will only glow as long as the glow stick itself would last. Hi guys! I am third year Industrial Design major at Georgia Tech. I fell in love with STEM in middle school and have been pursuing it ever since. I'm so excited to be creating content for you guys! Raindrop Cake, Not a Cake?